The problem of money is not its unit of account function. Yes, we need just weights and measures, in money too, but just weights and measures are stable and predictable. It does not matter what they are, as long as people know what they can expect. At this point the Dollar (or Euro) provide a reasonably stable unit of account and everybody knows what they are worth. Therefore I suggest not complicating the issue and just settle for the ‘1 unit = 1 dollar’ agreement. This is how most regional currencies and professional barters work. On a national level this would also facilitate an as simple as possible transition. We can simply replace the current usurious dollar with an interest-free one. For this reason, some resist the idea that for instance a major unit like the WIR is Mutual Credit: there a strong central credit facility, the WIR bank, decides who can borrow how much and charges service and handling fees and nowadays, sorrily, even some interest. As we have been discussing extensively, credit can be interest-free if it’s mutual. Nature unfolds as a process between two only seemingly opposing forces: the binary opposition of Yin and Yang. Debit and Credit are its equivalent in money. The one is not better than the other. By accepting the credit of the other today, we are allowing ourselves to finance our home and business ventures tomorrow. They are officially ‘restrained’ by ‘capital reserve requirements’. This is then used by the Bank of International Settlements, which is the apex of the global banking cartel, to manage the global volume of money: if they raise the capital reserve requirements from 3% to 4%, the banks can ‘only’ lend 25 times more than they can ‘back’, instead of 33 times more. This chilling effect on their capacity to lend leads to a contraction of money, which in turn will lead to depression. This is the game they play, late 2012 BIS ‘expected’ (made clear that they were going to create) the next round of bank busts and a deepening of the depression. “But hey, we need stable banks, no?” The wide eyed banker/magician tells us. How much do you think a interest free and monopoly free economy would increase the standard of living? If it increased it by 5 times people could just save for four years and buy a house without the need for a loan. If it increased 10 times (i doubt it) Loans would be given a small fraction as much as they are now because people wouldn’t need them as much. I would end the financial market. Shareholding, stock exchange and commodities market should go. The Stock Exchange is a function of Usury and scarce money, and even more pleasant to the Bankers: instead of lending and hoping for default, ownership is surrendered immediately. No entrepreneur is going to the Stock Exchange if he can get interest-free credit. Anthony: A great website we just got up running is http://www.credittothepeople.org Can you read it and comment?…especially on John Root’s PREZ, understadning money. Our current debt based monetary system necessitates the lies, deception and corruption. Why? Because financial debt with interest (usury) is mathematically impossible to pay back in the aggregate. How? When homeowners or students or even businesses borrow money, they, are creating “NEW” money in the system/economy. Believe it or not, banks do not lend money, they actually “steal” through a deceptive contract, the “NEW” money created by the so-called borrower and make them sign a loan with interest. We are all guilty, including myself, of the pyramid scheme we have bought into. Best solution: Wake-up and understand money and begin to issue credit to the people, by the people and for the people. And this too: http://www.akhuwat.org.pk/ – interest-free lending for small businesses. This is an existing and successful model of lending that is currently thriving. I’ve read your articles and would like to join in the conversation. Are you familiar with State Charted Credit Unions in the United States? If so what are your thoughts on how they operate? They charge interest but are membered owned and operated whereas the profits are returned to the members. well, they’re much better than BoA, that muchis clear. But I’d say they’re based on outmoded and faulty thinking nonetheless. We can do well without interest and even with the credit unions the usury redistributes from borrowers (the poor who need money) to the rich (who can save). I’m not really sure what the utility discussion is all about Gary: that the money system should serve the community (and not the producers of money) is a given for me and underlies all my writing. “Mutual Credit” exchanges may provide a convenient way for individuals to accept the credit of others in a local system of special trade tokens but it is no substitute for a national currency. Nation states will never truly be free and independent unless they issue and control their own currency. Why would ultra low cost and intrinsically stable credit creation be impossible for the national level Larry? Isn’t MC much better than fractional reserve banking credit creation? Hello Anthony – yes, I think a national currency should be stable and sustainable, unlike now. Mutual credit relies on the participants ability to repay/secure the loans but a national currency provides the added strength and power of sovereign credit. A sovereign state may deem that the money they create (sometimes indirectly through banks) must be accepted in the payment of taxes, debts, fees, etc. It is always in demand. Anthony wrote: Isn’t MC much better than fractional reserve banking credit creation? Both MC and “fractional reserve banking” will have some percentage of defaults and as part of risk management; both should keep a reasonable amount of capital on hand to absorb losses. This can also be done through insurance policies but again, they would keep some amount of capital available to handle defaults/failures. The term “fractional reserve banking” no longer holds any significant meaning. Banks simply do not require “reserves” to create loans. What they require is at least a minimum amount of capital on hand to weather storms and conduct transactions. The risk is calculated by the various jurisdictions including State and International Banking Accords and a lot of agencies between. Interest is not required by private or public banking. There are other ways for lenders to generate the needed capital, meet expenses and to turn a profit (e.g. service charges). Let there be no mistake: the State should finance itself through this system also. But, as you know, I focus on interest-free credit for the commoner, as many proposals out there only save the State from interest-slavery. In fairness: in an interest-free economy, the State should be able to manage without debt. Let it just take what it needs through taxation, preferably on wealth. The current situation is that most sovereign debt is about the same as the nations have been paying in interest on the debt over the last couple of decades, meaning that there would be no debt, had there been no interest. I’m not concerned about defaults: they can always be completely comfortably absorbed, because the credit facility (public bank, if you insist, I propose doing away even with the word banking), can always take the no longer backed money out of circulation by passing on the cost for this to borrowers. A case could also be made that all the users of the system should help pay, even when not in debt, there is no need for a lower status of ‘debtors’. So there is absolutely no need for ‘capital reserves’. These are just a completely bogus tool that the banking fraternity uses to play the instability this creates. Please check your co-relation between interest rates and investment. Evidence says periods of higher rates experience greater investment. there is a correlation rduanewilling, but higher interest rates follow higher investment, not the other way around. CB’s raise interest rates during upturns both to get their piece of the action and to prevent overheating of the economy (because of excess credit). High interest rates precede recessions. The late seventies is a textbook case. German reunification another. Richard, there is another point, I think you might have been referring to: if a country has high interest rates, it will attract a lot of foreign capital. In that respect high interest rates do have a positive effect on investment. Domestically though, high interest rates will disincentivize investment for those who need to attract capital to do so. A few questions/remarks for you, Anthony. You seem to prefer that the dollar/euro be replaced all together, judging by this remark: “On a national level this (1 unit = 1 dollar/euro) would also facilitate an as simple as possible transition. We can simply replace the current usurious dollar with an interest-free one.” Would this entail giving billions of units to someone who owns billions of dollars/euros at present? I can’t imagine that you could just replace the dollar/euro with another unit and just tell some billionaire: “Sorry billionaire, you only get a million units, even though they’re supposed to be equal to the dollars/euros that you once had.” (And if you did try doing that, then you’ll make powerful enemies for sure.) But if you did give billions of units to dollar/euro billionaires, then you will be giving tons of power over the new unit to the very people who probably liked the old way… That might be short-sighted too. 2. Regarding paper/coin cash reserves. If you get rid of paper/coin reserves in order to simplify the new credit system, then you will see backlash among people who like paper/coin money. A monopolistic all-digital/all book-keeping money system would be a power grab that some people would oppose on principle, even if the new money system is designed to be benevolent. People can always trade commodity for commodity (there’s no preventing that), so I don’t think it’s a huge deal, but anyone attempting to replace paper/coin reserve banking with an all-digital/all book-keeping money system should expect strong opposition. That opposition will be rational and not immoral, so a lesser-of-two-evils justification simply will not do. However, if you can design an interest-free money/credit system that can successfully coexist with paper/coin reserve banking, then I would expect that much of the resistance would be mollified and disappear. I intend to write an article on the transition to a fully MC based economy, and I will go into some of the issues you mention here in that article. But let me give a few hints in what direction my thinking is going. 1. No, I don’t squirt around at all: I’m fully committed to do away entirely with the current system, let there be zero doubt about that. Banking is the enemy. Banking is One and Banking and Money Scarcity and Usury are One. For as far as I’m concerned they’re all headed for a memory hole. The transition would basically simply be: refinancing all loans interest free. All circulating euros and dollars are debts to banks and would continue to exist, although the Euro must go too, of course, as it’s unsustainable, also interest-free, and an outright attack on national sovereignty. Theoretically nobody would get burnt. But in general in must be clear that the perceived ‘rights’ of investors play only a very small role in my world view. The idea of ‘return on investment’, which is Capitalism, is based on Usury and there will be hardly any financial sector left when we go interest-free. These people can go find a job doing something productive. The economy will boom, so that should not be a problem. The richer they are, the less I care about their ‘rights’. They are so rich because of Usury and other outright frauds and their gains are ill gotten. Normal middle class savers have very little to worry about. 2. Nono, I’m all for cash! In an MC system there is always sufficient cash and all balances can be withdrawn in cash at all times, even all simultaneously, if needs be. Whether the money supply is paper or electronic is immaterial and they should be completely interchangeable. The credit facility should never face problems due to scarcity of paper money. If necessary, more can and must be printed. 3. As I said in point one, the current system must simply go. I don’t talk about corruption in finance. Finance itself is corrupt. I’m not at all interested in the jobs of bankers, investors, traders and the like. Many of them are sociopaths and banks actually select candidates on sociopathic tendencies. However, you are absolutely right that a badly managed transition could cause short term upheaval on commodity and other asset markets. I will discuss this in more detail in the planned post. The goal is a complete transition to a Usury free economy, but obviously utter disgust for the current paradigm cannot excuse irresponsible behavior. Thank you for your quick response. The only point I feel compelled to make in response is that if an interest-free money/credit system does its job right (i.e. is sound and charitable), then there will be less demand for loans (and debt) anyway. If the current money system coexists with an effective interest-free money/credit system, then people could choose to use whichever system that they want – or both. Coexistence of money systems gives people more choices and greater freedom, whereas monopolies reduce choices and reduce freedom. Yes, very much so: abundant money will radically diminish debt. Also, money will start circulating much quicker, meaning the money supply will probably start collapsing in the early stages of the transition, to balance out at its new natural equilibrium. It’s particularly difficult to fathom the effects of this in the short term. I understand what your saying with the monopoly bit. There are two angles: when people have a choice between financing at 5% or 0%, I think it’s a fair bet the 5% option will find little traction. So it’s not an enforced monopoly, but a natural one. The second angle is, that good national money does not preclude other currencies. I have no desire for legal tender laws, for instance: national money becomes national because the Government accepts it, there are no further laws necessary. Other units are welcome. If they can survive vis a vis 0% national money, than why not? In fact: I believe there will always be a case for regional currencies; lesser competitive regions would face deflationary pressures if they import more than they export. This could be addressed with regional currencies. Good response, although I still think that taking an antagonistic/confrontational stance towards the present money system is dangerous and unnecessary. (For example, statements like this are worrying: “The richer they are, the less I care about their ‘rights’.”) I say this because I care about the well-being of everybody, including: you and partisans on your side, partisans on the status quo’s side, partisans on any other side, and any innocents who might be harmed as collateral damage in a potential conflict. I’ve tried very hard to understand the merits and reasoning of all sides in these monetary debates. I’ve read arguments coming from every side I can find and I think that all positions (whether it be the status quo, Austrian economists, or the interest-free crowd, etc.) have merits and make some good points that should be taken into serious consideration. However, I think that all of those positions have dogmatic tendencies and potentially serious flaws, which is why I recommend against taking an antagonistic/confrontational stance towards your opponents (but I still encourage you to criticize your opponents and speak your mind). Thank you TR, point well taken. In terms of perspectives, I tend to take similar approach: study all schools and synthesize into your own, taking what is good of each and leaving the not so good there. Even my favorite sparring partners, the Austrians have given me plenty: healthy distrust of the State and keen focus on volume, for instance. I hear you on the rich. I don’t want to hurt anybody, most certainly not physically. But I think the main intransigence will continue to come from their side. However: I’m all for a peaceful and respectful transition. Mighel, some points of fact. The term ‘mutual credit’ probably goes back to the 19th century mutualist/anarchist movement with thinkers such as Proudhon and practical experiments such as the Cincinatti Time Store. Michael Linton’s original LETS description does NOT link LETS units to Hours. He specifically advocates, as you do here, linking LETS accounting units 1 to 1 with the national currency. Hours are advocated as the base calculating unit in Time Banks, which also advocate equality of each participant’s time: one hour of work = one hour of work whatever the service. However, it is also theoretically possible to use HOURS as the unit of account for calculating differential prices. I do not know of any system in practice that does this. Also harder to account for value of goods although some Time Banks attempt to calculate the time taken in producing goods into the price. 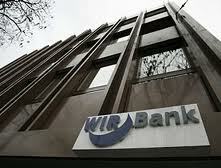 WIR Bank has been definitively proved NOT to be a mutual credit system. This is a widespread myth in the English speaking world. If definitions mean anything at all, mutual credit generally means “peer to peer credit by double entry bookkeeping” as you describe it. This means that any participant has the power to issue credit to other users at the point of trade. This does not happen in WIR Bank. WIR credits come into circulation as conventional bank loans in WIR currency backed by personal guarantees. I don’t agree on the take on WIR: in a purely peer to peer mutual credit system, we don’t give credit to customers. When we buy, we simply use the credit we have associated with our account. This is also the case with WIR or the kind of MC environment that I propose in the above. WIR, over the years, seems to have become a little heavy handed and nowadays seems to focus more on regular banking. This is why Greco claims the Money Power has got its people on the board. So it is unfortunate, but it seems more historic than current example. Which is unfortunate. Still, it seems to serve a reasonable function in the community even today. 1. Are all labor hours equal? (Is the labor hour of a skilled worker (ex. a doctor) or someone who does an undesirable job (ex. working in sewage) equal to the labor hour of someone with a cozy, easy, rather unskilled job (ex. cashier, waiter)? 2. How many hour units would be in circulation? 3. When would hour units be created and retired? Interestingly, the Protocols (great masters of the monetary) propose hours as a unit of account. In LETS and Time Banks, yes, all hours are supposed to be equal. But that also is a real problem, because the users do not really accept it. Yes, the poor do, but skilled people don’t. Hours are created by having people use their credit limits. LETS is not very mature in its development, so real volume issues have not occurred, for as far as I’m aware. The amount of credit is usually settled in the house rules of the network using them. Typically there will be a board organizing it and 1 person, 1 vote general council.